Do you love vocal jazz? Ever considered what it would take to turn your passion into a career? In this article, we look at what vocal jazz programs offer, what it takes to get accepted, and what you can do with your degree after you graduate. Acclaimed jazz vocalists who also teach college-level programs share information and candid thoughts to help you figure out whether this is the right path to pursue. You’re most apt to find jazz voice training in college music programs listed under Jazz Studies. Your instrument is your voice, so look for programs identified as Jazz Voice, Jazz Vocal Performance, or simply “Vocal Concentration.” If you’ve found a school you’re interested in but don’t see vocal jazz listed as a major, contact the school directly to see whether they offer what you want to study. Note that many schools offer classes in vocal jazz but not as a major. And at most schools, a vocal performance degree has a classical focus, not jazz. 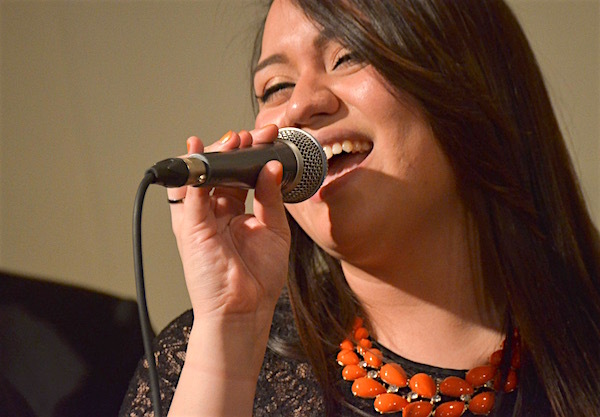 Schools that offer a major in Vocal Jazz want students to get a well-rounded education. In addition to general education requirements and applied voice lessons and jazz vocal technique, you’ll also study vocal jazz history and analysis of styles, composing and arranging, and improvisation. Ensembles are also part of the curriculum. Some schools require classes in classical voice while others do not. For future career opportunities, you’ll serve yourself well by taking any classes, programs or workshops offered that teach music majors how to think of themselves and market themselves in business terms (i.e., entrepreneurship training). Check the career services office if these types of classes aren’t clearly offered through the music school or department. Who is a good candidate for this major? Vocal jazz programs are all looking for students who are really passionate about jazz, have some kind of background in the language of jazz, and are ready, willing, and excited to learn more than they already know. Basic sight-reading skills are expected. Good tone and intonation are also important going into this major. “Jazz is so much about community, hearing each other perform and jamming with each other,” says Rosana Eckert, senior lecturer who teaches in the Jazz Vocal Performance degree program housed in the Division of Jazz Studies at University of North Texas. Those who don’t see themselves doing this work professionally should not attempt this major, says Elisabeth Lohninger, who teaches Voice and Ear Training at the School of Jazz at The New School. She also emphasizes the importance of a solid work ethic as essential for any vocal jazz major. What can you do with a degree in vocal jazz? What are schools looking for in an audition? An audition demonstrating your current vocal jazz skills is required by most programs. Every school has its own audition repertoire requirements, so check them carefully. Following directions about the audition speaks volumes to college admission folks about the kind of student you’ll be if they admit you. Schools do not expect you to be advanced in these areas. Instead, they want to see that you’ve already begun to learn how to do these and that you show up as someone who is eager about and capable of learning more. Your background in areas like jazz theory, aural skills (harmonic identification), melodic recall and piano skills is also likely to be assessed. Note: Some schools require a pre-screen recording to determine whether to invite you to audition. Check each school to see if a pre-screen is required and if so, look carefully at the required repertoire, recording guidelines and deadline for submission (often December 1). How about summer vocal jazz programs? 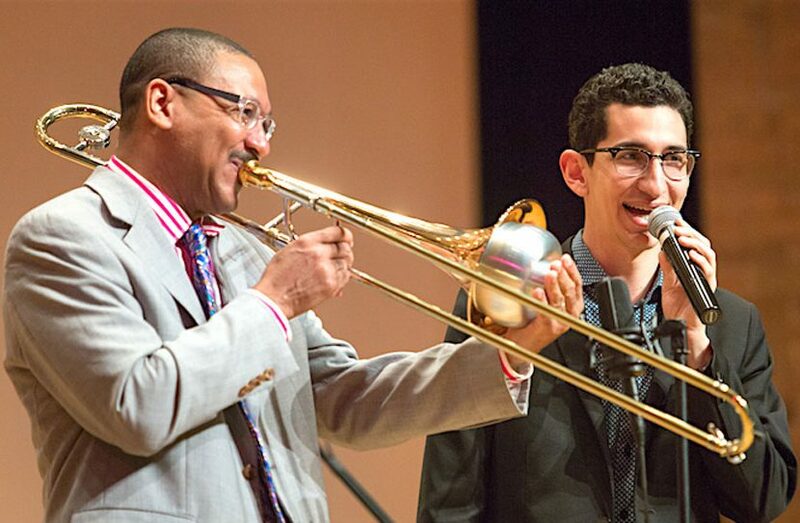 Summer jazz camps and programs throughout the U.S. and abroad provide the opportunity to dig deeply into vocal jazz without the burden of school, work, and time-consuming distractions. They also offer wonderful opportunities to network with professionals as well as other students passionate about singing jazz. You’re apt to find classes in jazz theory, improvisation, vocal technique, and keyboard skills along with solo and ensemble training and performance opportunities. If you’re getting ready for auditions, look for programs that will help you start preparing. When is a graduate degree important? University of Miami Frost School of Music top jazz vocal ensemble, Frost Extensions, performs at the Monterey Next Generation Jazz Festival. Rosana Eckert, senior lecturer in Jazz Vocal Performance at University of North Texas, is a live and studio vocalist, songwriter, and voice-over talent who has sung or spoken on hundreds of commercials, album projects, publishing demos, and radio IDs around the world. She has recorded four solo CDs and performs regularly throughout the U.S. and abroad. Eckert also serves on the faculty of the New York Voices Summer Vocal Jazz Camp and University of North Texas Vocal Jazz Camp. La Tanya Hall, teacher of Jazz Voice at Oberlin Conservatory and School of Jazz at the New School has collaborated and appeared with performers across many genres (including Harry Belafonte, Aretha Franklin, Quincy Jones, and Steely Dan) and has toured and recorded with Bobby McFerrin since 2002. She teaches master classes with the YoungArts Foundation and is also a session singer and actress. Hall has sung at international festivals and with several U.S. orchestras, and has an album out on Bridge Records. Greg Jasperse, assistant professor of Jazz Studies and director of Vocal Jazz at Western Michigan University School of Music, is a composer, arranger, clinician, adjudicator and guest conductor. He has sung on many film soundtracks as well as Red Hot Chili Pepper’s song Monarchy of Roses and Muse’s album The 2nd Law. He sang at the 85th Annual Oscars with Adele on her song Skyfall and arranged, produced and music-directed A Gallagher Family Christmas for William H. Macy and the cast of Showtime’s “Shameless.” Jasperse sings with Sixth Wave and Vertical Voices and spends summers teaching at New York Voices Vocal Jazz Camp, the University of North Texas Vocal Jazz Camp, and Showchoir Camps of America. Elisabeth Lohninger, teacher of Voice and Ear Training at the School of Jazz at The New School since 2002, has 11 albums to her name and and regularly tours Europe, Asia and the Middle East. In fact, she was touring in Germany while contributing to this article. She maintains a private voice studio in New York City, performs in four languages, and has had song placements on television. Kate Reid, associate professor and program director of Jazz Vocal Performance at University of Miami Frost School of Music, maintains a solo performing career in Miami and Los Angeles. She has several albums out and as a session singer, has lent her voice to film, television and artists’ albums including Planes, Star Trek Into Darkness, Epic and Men in Black III and albums for Josh Groban, X-Japan and Muse. Reid is a master class presenter and a clinician and adjudicator at jazz and choral festivals throughout the U.S. She also teaches at the summer Young Musician’s Camp at the University of Miami Frost School of Music.